Rovio Entertainment released Angry Birds Space, the latest spinoff in its series of popular Angry Birds video games, on March 22. The popular pastime of flinging furious feathered flocks to destroy egg-stealing swine has at last been launched into the final frontier. After weeks of promotion including a video demonstration from aboard the International Space Station, Rovio Entertainment released "Angry Birds Space" today (March 22), the latest spinoff of its globally successful series of Angry Birds video games. The astronomical app is now available for Apple's iPhone, iPad and iPod Touch, Google Android mobile devices, and Mac and PC computers. "From floating through space in zero gravity, to using the gravity of nearby planets to set up spectacular trick shots, Angry Birds Space takes the gameplay that fans already know and love to a totally new level," Rovio described in a statement announcing the game's availability. "With brand new birds, brand new superpowers, and a whole galaxy to explore, the sky is no longer the limit!" Angry Birds Space marks the first integrated multimedia launch for Finland-based Rovio, with related merchandise, animation shorts and books available at the same time as the game. Wal-Mart will stock limited-edition T-shirts, plush toys and snacks that come with clues that unlock bonus levels of Angry Birds Space. National Geographic has published an official companion book that uses the game's characters to illustrate the real solar system and beyond. Floating between the "Pig Bang" and "Cold Cuts," the first two planet levels in the Angry Birds Space game, players will find the International Space Station — complete with a billboard displaying the NASA logo. Rovio partnered with NASA to help promote the launch of the game. In a video released online earlier this month and viewed more than six million times since, NASA astronaut Don Pettit demonstrated playing a real-life version of the Angry Birds Space game while orbiting the Earth on the space station. NASA collaborated with Rovio to share the excitement of space with the Angry Birds community, educate users about NASA's programs, and collaboratively create interactive educational experiences for the public. "Games are fun and entertaining, but they also can be inspirational and informative," said David Weaver, NASA's associate administrator for communications. "This ongoing collaboration with Rovio and Angry Birds is an exciting way to get people engaged with [the agency's] missions of exploration and discovery, and get students energized about future careers in science and technology." Clicking on the animated space station in the game brings up a message, "Do you want to learn more about space and NASA?" If players agree, they are then redirected to NASA's website where the agency offers more information about a core concept of space exploration and the game: gravity. "Not only does gravity play a vital role in the game but, in general, gravity is a force that governs motion throughout the universe. It holds us to the ground, and it keeps the moon in orbit around Earth and Earth around the sun," NASA explains on its Microgravity website. In Angry Birds Space, a giant claw descends from the sky and kidnaps the birds' eggs. The Angry Birds then chase the claw into a wormhole, gaining new superpowers in the process, and they eventually find themselves floating in a strange galaxy and surrounded by space pigs. While the set-up may be the stuff of fantasy, the physics that controls the birds' movements through zero-gravity is based on real-world calculations. To win each level, players need to take advantage of the microgravity space environment to trigger chain-reaction collisions by plotting trajectories for the birds using the pull of gravity from planets and other celestial bodies. As the levels advance, so do the planetary interactions needed to defeat the pigs. "Science and education are very important to us," said Andrew Stalbow, Rovio's general manager for North America. Angry Birds Space is now available for $0.99 from the App Store for the iPhone and iPod Touch, and Angry Birds Space HD is available for $2.99 from the App Store for the iPad. Angry Birds Space for the Mac is available for $4.99 from the Mac App Store. The game is also available for Google Android mobile devices for free with advertising. Ad-free versions of Angry Birds Space will be available on Android for $0.99, and an HD version for Android tablets will sell for $2.99. The retail PC version is available to download for $5.95 from Rovio's website. 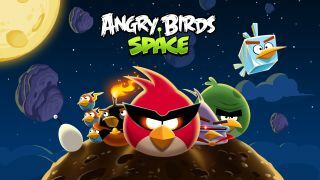 Continue to collectSPACE.com to watch animation and preview Angry Birds Space.